Alija Izetbegovic, the first president of Bosnia and Herzegovina, said, "We play an active role and try to influence our destiny; we have our own trump cards and we use them." When a defender uses a trump card, declarer should try to make sure he is ruffing a loser, not a winner. And that is the key point to this deal. Against six hearts, West leads the club queen. 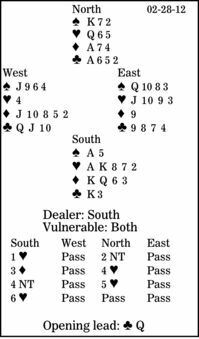 Since there seem to be 12 top tricks (two spades, five hearts, three diamonds and two clubs), South takes that trick with his king, cashes his heart ace and plays a trump to dummy's queen, learning that he has an unexpected loser there when West discards a spade. How should declarer continue? North's response depends upon partnership agreement. When two no-trump is natural and game-forcing, it is easy. If two no-trump would be the Jacoby Forcing Raise, North must start with two clubs (unless three no-trump would show 13 to 15 points and 4-3-3-3 distribution). An easy-looking contract has suddenly become difficult. The secret is not to permit East to ruff a diamond honor. Declarer should cash the diamond ace and play a diamond toward his hand. East ought to discard, so South wins with his king, returns to the dummy in a black suit, and leads the last diamond. Again, East should pitch, but declarer wins and ruffs his last diamond on the board to lose only that one trump trick.